Successfully Added Mini Green and Red Laser Effects Projector with Sound Activation to your Shopping Cart. 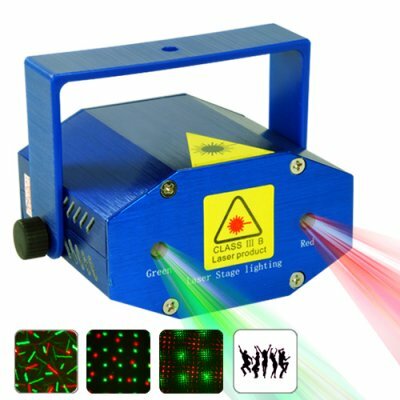 Get the party started with this awesome Green and Red class 3B laser effects projector with sound activation. This automatic Laser effects projector with music activation is perfect for small to medium scale home and office parties. This Green and Red class 3B laser effects projector with sound activation comes in a metallic blue aluminium finish with a dual laser projecting each a single beam of Green and Red laser that displays beautifully designed patterns that will astonish your friends, guests and family members. The MIC works by detecting the sounds waves from your music and then the high tech internal gears activate, and the laser unit starts to project and display laser patterns in Sync with the beat of your music. Another great feature is the speed control button also located at the rear. This feature allows you to adjust the speed of the laser patterns, this way you can always choose the speed of the laser projection depending on the tune you’re listening to. This brilliant home music laser projector gadget is in stock now and available to you at a low China Wholesale Price with no minimum quantity order. So click "Add to Cart" right now and we'll express ship your order so you can start enjoying those home and office parties even more than before with this cool Mini Green and Red Laser Effects Projector with Sound Activation. Does this Automatic Moving Laser Effects Projector with Sound Activation come with a remote control? What distance can the Red and Green lasers project out?